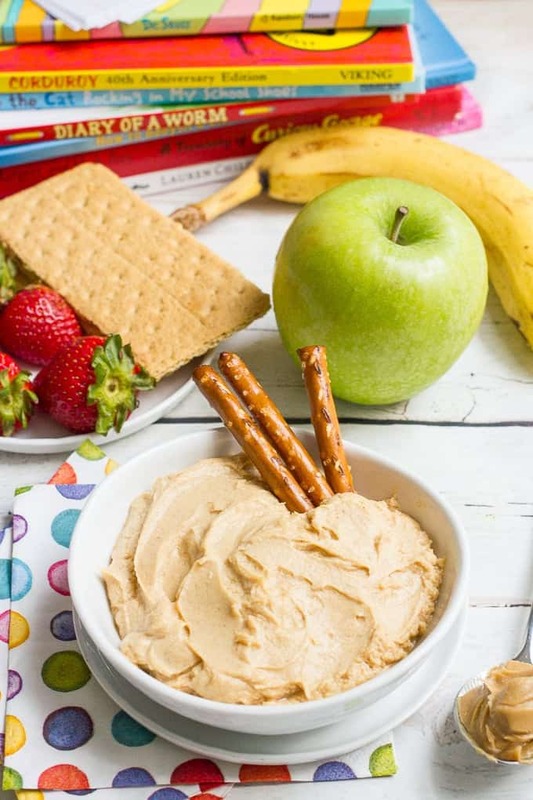 This 5-ingredient, 5-minute creamy peanut butter yogurt dip is delicious with fresh fruit, graham crackers or pretzels for an afternoon snack! We are all big book people in my house. My kiddos love to read. They are both excellent snugglers and we always end the day curled up on the sofa with at least a couple of books before heading up to bed. Sometimes we have reading time in the morning or afternoon, too. Helps us slow down and reconnect. M, my oldest, who is 5, is headed to kindergarten in a few weeks. As that start week draws near, the tightness in my chest seems to build a little. I know she’s gonna love it. I know she’s gonna thrive. I know she’ll make great friends, fit right in and be ready for all the learning challenges they can throw her way. Honestly, I hope they keep up with this one! I know the rest of us will be fine, too, but it will be an adjustment not having her home as much. Poor J will be so sad without his big sis around all the time – they are great buddies. And with M in kindergarten and J in preschool, we’ll have to juggle two drop-offs and two pick-ups every morning and afternoon amid our full-time jobs. I know, too, that M is going to be exhausted at the end of the school day and need some quiet, down time. A book and a cuddle with mama will be just the thing. 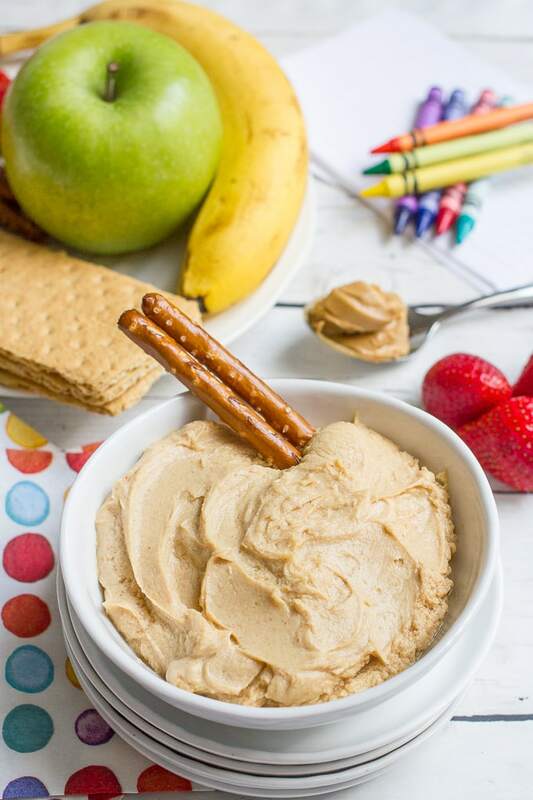 So today I’m sharing this creamy peanut butter yogurt dip. It’s a super fast, super simple after-school snack I can set out for us to munch on while we chat about her day, find a story and have some mother-daughter time. And I’m excited to share with you the back-to-school special currently happening at Sam’s Club®. You can get two free Scholastic books – one for yourself and one to donate to a local school – when you buy any participating Kellogg’s® or J.M. 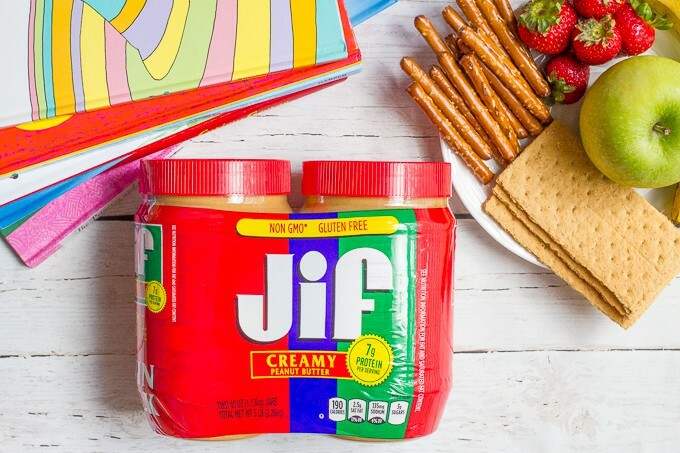 Smucker product, like this Jif peanut butter I stocked up on when I went to Sam’s Club recently. You’ve got more than 80 Scholastic books to choose from, so you’re sure to find a new favorite for your kids. Put this on your to-do list because the products have to be purchased by Sept. 30 and it’s while supplies last. 1. Buy any participating Kellogg’s or The J.M. Smucker Company product by Sept. 30. 2. Upload your receipt at FreeBookOffer.com/Sams within 30 days of your purchase. 3. Claim your free Scholastic book and one book will be donated to a local classroom as well! A new school year calls for some new fun books, right? And all the crayons and notebooks too 😉 Oh, I love back-to-school shopping! 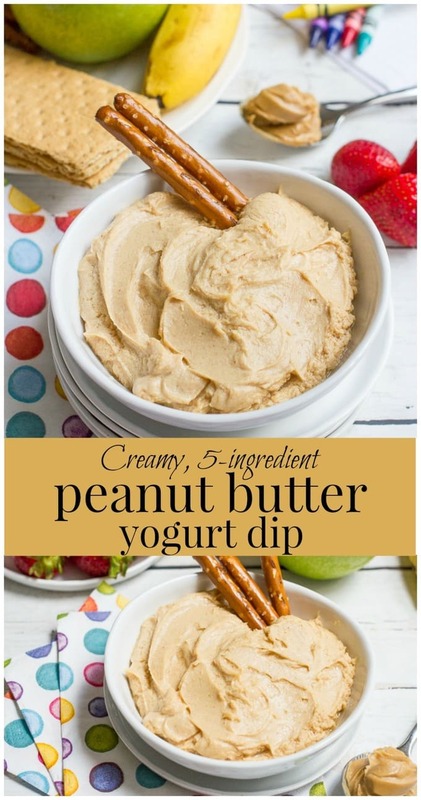 So, this peanut butter yogurt dip. 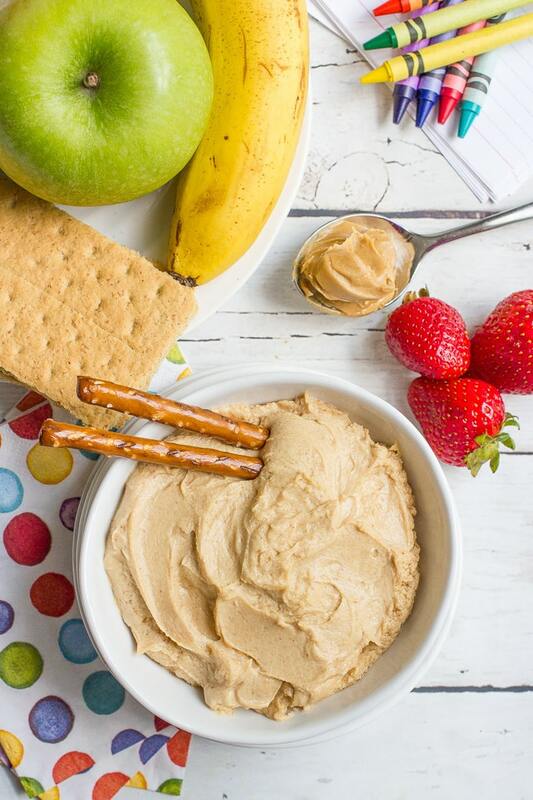 It’s cool, it’s creamy, it’s dip-tastic with everything from fresh fruit to graham crackers to pretzel sticks. If your mixture is too thick, add a small splash of milk. If it’s too thin, add another small dollop of peanut butter. Get it just where you like it. You can add another teaspoon of honey to peanut butter and yogurt mixture if your kids prefer a little more sweetness. You also could add 1/2 teaspoon ground cinnamon to the mixture for some extra flavor and warmth. Crumble some graham crackers on top if you want a little texture in your dip. 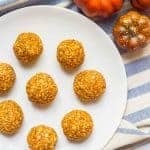 Substitute canned pumpkin puree for yogurt for a fall treat – I’ll definitely be trying this since we are pumpkin obsessed! I hope your back-to-school season goes smoothly. I hope ours does, too, and I hope I don’t bawl too uncontrollably on her first day. All you moms who’ve been through this before, send me your words of wisdom, would you? In the meantime, happy snacking and happy cuddles. Enjoy! 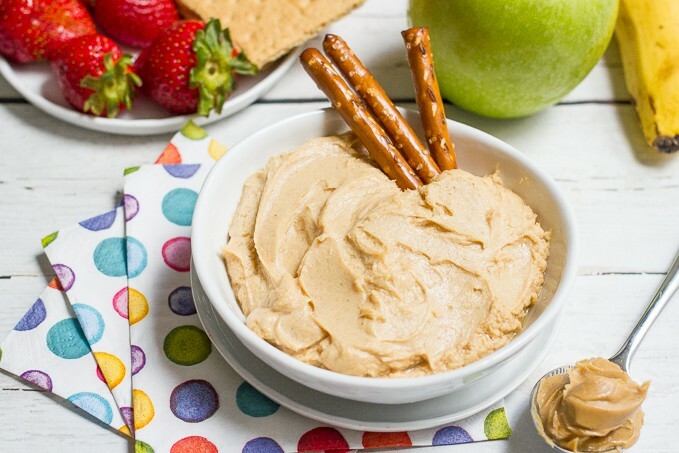 5-ingredient creamy peanut butter yogurt dip makes a perfect afternoon snack! Mix all ingredients together in a small bowl and stir until smooth and well combined. Serve with sliced apples, bananas or strawberries, graham crackers, pretzels or just some toast! If your mixture is too thick, add a small splash of milk. If it’s too thin, add another small dollop of peanut butter. 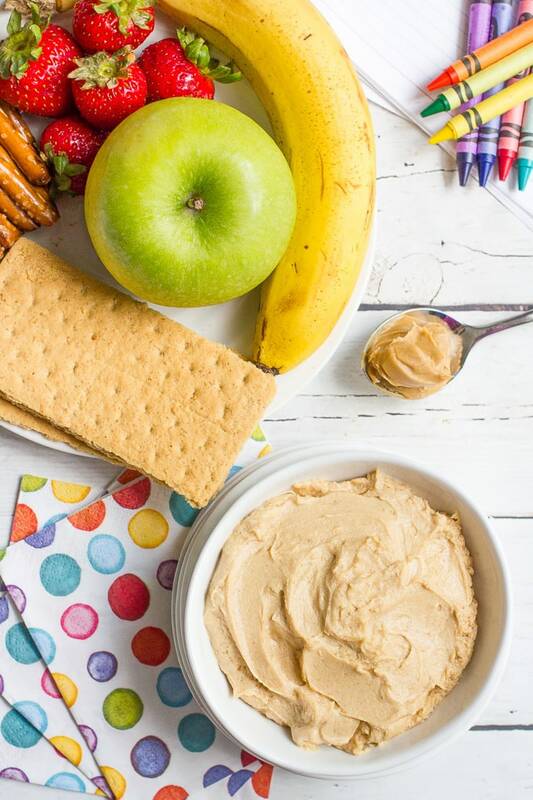 Books and peanut butter yogurt dip – what could be better? Hang in there, mama – I promise you will make it through the first day of kindergarten. Take lots of pictures, and it’s okay if you need a few tissues, xo! Happy to hear the potty training to going well!! Yay! And kindergarten for your other little one? So exciting! I’m sure she’ll make lots of friends and will love it. So great that your little kiddos love books! Hopefully, it’s something they keep up with as they get older. I loved reading as a kid (and still do), but often don’t make enough time to do it. There’s just not enough time in the run of a day, is there? Thanks Tawnie! So simple and so irresistible, right?! fast, simple, and yummy…totally all me!! 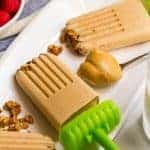 That is such a fun (PB-licious) snack for the kiddos to have! Can’t go wrong with a creamy peanut butter treat, right?! They gobble this up! Augh! 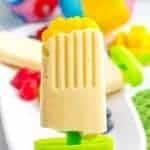 I definitely need to try making this! <3! 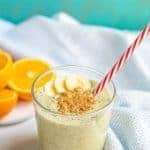 Love that it only takes 5 ingredients! ;]! 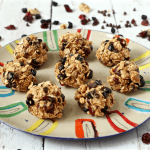 So simple and quick – you gotta make it!! YAY to successful potty training!! I know you guys had tried before without much success, so I’m glad this round is going much better! Woot woot! And Kindergarten! Your girl is going to have a blast! I wish I could go back to grade K! lol. As for this dip, umm GIMME! Forget the crackers or fruit, I could just face plant into this bowl! So creamy and peanut-buttery delicious! Cheers, girlfriend! 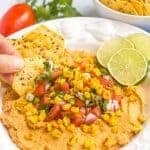 This dip looks so delicious! Yum, love it with apple slices this fall! Yes! Fresh fall apples would be amazing with this dip! Like you, my eldest boy (who is 4) is starting school next week. He loves peanut butter, so instead of getting tempted to stand outside the school gates all day waiting for him to finish, I’ll make this! He’ll love it! Haha, I hear ya – it’s so hard to see them go off! You’ll need to find a few other things to keep busy though – this takes just minutes to make 😉 Good luck mama!